We are proud to feature Kristin Pezzuti as our current Safe Passage Project Attorney of the Month. Kristin is a defense litigation attorney at Wilson Elser where she specializes in representing physicians and other health care providers in medical malpractice matters. Kristin learned about Safe Passage through her firm’s pro bono program, and began working on her own Safe Passage case in 2015. Kristin explained that while she had worked on several other pro bono projects in the past, her Safe Passage case was the first pro bono case of “magnitude,” where she worked on it from start until finish. Kristin’s case was a bit unusual in that she had three sibling clients at the same time. “Working with three clients was challenging but three times as rewarding,” Kristin explained. “Each client has a distinct personality and had their own experiences that influenced how we prepared their asylum applications.” Kristin recalled that the eldest brother experienced a lot more direct threats whereas the youngest brother did not have as many memories of the experience. Kristin made sure she met with each client individually as well as together. “Preparation was key to consistency and that we all had clear understanding of what actually happened,” said Kristin. “Additionally, affidavits from mental health professionals were important. They explained that due to my clients’ ages and experiences, their memories may be vague, but, this has to do with age and trauma, not credibility.” Ultimately, Kristin was able to obtain asylum relief for all three of her clients. Kristin believes that once attorneys start taking pro bono cases “they get hooked” and will want to take more. Kristin recommends taking a case with Safe Passage because attorneys have “a lot of independence and ability to be creative while still always having someone available for guidance if you have an issue to discuss.” Kristin also wants attorneys to remember that there is a great need for pro bono in the community, and if an attorney is hesitant to take on an entire case, there are many non-profit projects with other types of pro bono opportunities. 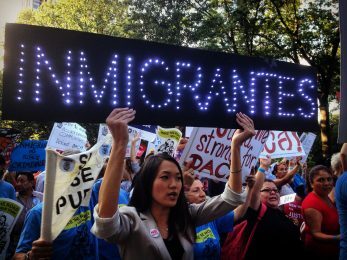 For example, in addition to her pro bono work with Safe Passage, Kristin currently volunteers with New Sanctuary Coalition of NYC where she advocates for immigrant rights. We thank Kristin for her dedication and commitment to pro bono projects. We look forward to working with you on additional Safe Passage cases in the very near future. Thank you!